The trailer for Déjà Vu completely misrepresents the film, as does the title itself. This isn’t a supernatural thriller (or indeed anything to do with déjà vu), but actually a different genre entirely. The fact that they didn’t make this known in the marketing material either means that a: they don’t think there’s enough money in that particular genre, or b: they wanted it to be a surprise. It was a lovely surprise, to be sure. I’ve long been pissed off at trailer editors for ruining films, and thus twenty minutes in I was captivated, wondering what the hell was going on. I won’t go into any further detail – to do so would spoil the surprise. That first half (or two thirds) of Déjà Vu crackles with an intensity that is truly astounding. 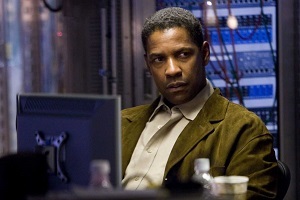 Denzel Washington is one of those unfortunate well-paid actors who seem to only attract boring leading roles. Sure, The Manchurian Candidate and Training Day shook things up, but other than that he’s stuck with the traditional cop in search of the truth. Looking through his resume of characters we see Detective Keith Frazier, Det. John Hobbes, Lt. Colonel Nathaniel Serling, Lt. Parker Barnes, Lt. Commander Ron Hunter… wouldn’t it be great to see him mix it up a little? He’s good at what he does, but imagine seeing him as a streetwise gigolo, millionaire fashion designer or a man returning to civilisation who from a young age was raised by wolves. I know there’s hundreds of actors in Denzel’s position, and I’m being a little unfair to single him out, but it just gets to me after a while. Even cop-extraordinaire Bruce Willis has diversified a little in recent years. Jim Caviezel gets the delicious role of terrorist Carroll Oerstadt, and this is exactly what I’m talking about. Jim only gets two scenes in the entire film, but his few minutes in the spotlight are much more memorable than Denzel’s leading man. Val Kilmer is here (and getting broader) but it’s the trio of Adam Goldberg, Elden Henson and Erika Alexander that truly steal the show. When Doug Carlin (Washington) is first introduced to their team you know you’re in for something special. The film does them no justice, simply forgetting about them in the last twenty minutes or so. And this is where it all goes haywire. The final act manages not only to break all the rules that were fastidiously set up earlier, but also lazily cuts corners in the interests of rushing towards a ‘satisfactory’ (read: stupid) ending. There’s so much wrong with the final portion of this film, and it’s all the more depressing cos they’re destroying that mesmerizing first half. Director Tony Scott has had a patchy career (it’s hard to believe he once directed the eerie David Bowie vampire flick The Hunger), but Déjà Vu is a mess simply because it comes so close to being a solid film. This entry was posted in Film Reviews and tagged Drama, Science Fiction, Thriller by Stuart Wilson. Bookmark the permalink.